I saw a recipe for “spice bread” online several months ago, and I’ve wanted to do this ever since. I lost the recipe, but I had this general idea for the spices. I have to say that this is quite possibly the tastiest bread I’ve ever made. It almost tastes like a cake. I was really nervous about the spice mix. I tried to sample it beforehand, but it’s tough to tell how it’ll turn out with the bread and the honey. As with all of my breads, before making the bread, you should read my Squidoo.com lens on dutch oven bread making to grok my processes (that’s GeekSpeek for “understanding how I do it”). While that was frothing up, I played with the spice mix. I didn’t really know what I was getting or anything, I just chose a bunch of spices that I knew or had read work well in sweet dishes, like apple pies or bananna breads or things like that. I’d also read that oils can extract the flavors of spices, so after I’d mixed the spices up, I put a coupla teaspoons into the olive oil. 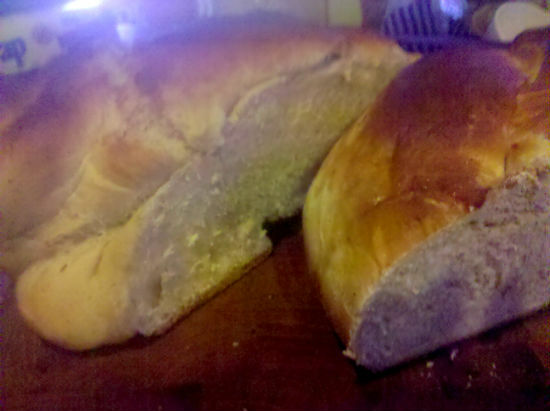 I tasted it, but I wasn’t sure if it would be enough spice to flavor a whole loaf of bread. Then, once the yeast water was bubbly, I added the ingredients in the second set, and the oil/spice mix together, and stirred it all up. From that point on, it was just a matter of kneading and raising and baking just like any other loaf of bread. I did know that I was on the right track, because I tasted a little pinch of the dough and it was goooooood. It was a little tricky to cook it out in the snow, but since I pre-heated the lid, it worked really well, and it baked in about 40 minutes. I kind of overcompensated on the bottom heat, so the lower crust was a little thick. The upper crust was nice, brown, and soft to the touch. The crumb was tender and tasted a lot like a spice cake. With a bit of butter, it was heaven.